Sometimes I wonder why we advocate better stories for Christians who do not “deserve” them. 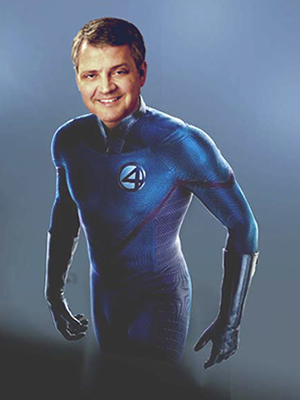 A little levity: the author’s graphic illustration (from 2009) of the uber-flexible Dr. Albert Mohler as Reed “Mr. Fantastic” Richards. Today I un-ask all my questions about Dr. Albert Mohler, president of Southern Baptist Theological Seminary and responder to a question I asked him last Monday. This was my question: Though you encourage Christians to read deep books, you never seem to recommend fiction on your website; how come?1 His response was well-reasoned, personal, and sensible. Yet sometimes I might think he didn’t go far enough. Frankly, some Christians don’t deserve awesome stories. And in difficult times I also wonder why we even bother pushing for more of them. I’ll just come right out and admit it, even grump a little: Earn2 great stories, then we’ll talk. Dr. Mohler’s remarks didn’t endorse this conclusion of mine. Here’s how it went Monday night, Feb. 10, at the small lecture and Q-and-A session at the University of Texas at Austin. Actually my sister-in-law, Lyric, nearly stole my question; hers ended up being a perfect lead-in. Based on Mohler’s refrain that good Christians engage culture and read, she asked what Mohler thought of stories such as the Harry Potter series or the Hunger Games series. I read a lot of fiction and enjoy fiction. But I find it very difficult to recommend fiction, so I tend to avoid that. I suppose I believe that one’s response to fiction, positive or negative, is far more personal than one’s response to nonfiction. If I were to recommend a particular novel, for example, and say it was wonderful, someone could immediately question why I didn’t see this or that element wrong or un-Godly about the novel. So I lean toward nonfiction. Sometimes I find myself taking his reasons to what seems an even more-logical conclusion. You know, this whole exploring-epic-stories thing is more trouble than it’s worth. Christians will make up their own reasons to hate, treat lightly, naïvely praise or else ignore great stories; what’s the point of spending hours of nonprofit time on the topic? Are most folks in this movement to explore God’s glories by exploring epic stories together, or mainly to promote their own stories and build autonomous careers? God spreads His eternal Kingdom through preaching and churchy things and other specific ministries, so really, isn’t all this simply trivial? Sure, God inspired creative, beautiful, and even artistically “dangerous” Psalms, and Jesus spent three years telling and re-telling parables that outpaced all other oral traditions from his era — but what are creative reflections of that kind of art compared to preaching sermons and overt Gospel work and giving to the poor and Saving the Nation from religious technocrats? We can have all the great stories published, reviews written, talking points about the truths and beauties of great stories distributed — and yet someone for whatever silly or supposed “sola Scriptura” reason is going to hate the story you love, and claim you are either lying to them about your motives or even going to Hell — so the point, again? That last returns me to Mohler’s comment. I can’t imagine what it must be like to have that kind of ministry “platform.” Suddenly you’re an Evangelical Bigwig. People want you to kiss their babies and bless their pets and write forewords to your latest greatest life-changing book. And no matter how much you speak about the value of personal-level education and discernment — to Mohler’s credit — people will try to outsource their discernment to you. And if you say something they don’t like — to my debit — people will grump at you for not taking up their pet cause or promoting your amazing ministry work or not also speaking out against Historic Abuse X that this group/person/affiliate once actually did. So no wonder Mohler avoids the fiction issue. If he compliments Harry Potter even once or says he found value in The Hunger Games, it’s clobbering time. Christians can’t handle the disagreement. Better to keep your head down, avoid specifics, and do your best to build better and more-thoughtful readers who read anything for personal joy and love for neighbors. In fact, this is exactly what Mohler and others are doing. Lately I wonder if I should also do this: simply help Christians earn the right to great stories. Then I can come back to the speculative fiction thing in about, oh, 50 years. Yet I love stories. And I love the friends these stories help give me. Still, it’s better to concede struggles like this. Let us not contribute to the notion that some of us are Super-Evangelicals who can’t be pained by weariness or just plain irritation with all those people who don’t “deserve” it. God Himself did not treat His people the same way. We didn’t deserve His greatest Story. And for all its flaws, I hope He will bless the Christian-spec-stories “cause” anyway. I feel like this is an honest introspection. And if I’m honest, I’ll admit that I’m mostly in this game out of self-interest: sure, most other Christians don’t deserve awesome stories, but I wanna read ’em, and thus wanna help clear some cultural space for ’em to exist in the first place. This phrase helps me a lot. I shall need to think about its meaning some more. Comments section, what’s your problem? I italicize something and you pretend it and the stuff beyond it doesn’t exist? Try #2. I was going to say, we might talk about cultural context? Context, the thing that warms my little pea-pickin’ heart? I think that you nailed it in your introspection. I remember I responded to your quote on Mohler by saying I wouldn’t like someone being that paternalistic to me, but it ain’t so simple as all that. To tie it into a point that I made before elsewhere, with the way that Christians in general have spent the past couple of decades trashing, lying about, and living in fear of, fantasy such as D & D, HP, so on, it is no wonder that major publishers, movie studios, so on, don’t want to risk money on something in the speculative fiction area for us. They think it’ll bomb AND they’ll be trashed. Maybe Mohler’s attitude is just a sad judgment on how pathetic many Christians are in having zero discernment. I wonder how much the bogus Satanic Panic of the ’80s-’90s has crippled Christianity. It got people so worked up and paranoid about relatively harmless things like goth aesthetic and, really, pretty much the whole of the genre of fantasy. The main reason you hear people screeching about HP is purely because of the robes, wands, and broomsticks stuff, the small-time junk. They seem to forget that in HP, nobody invokes demons or sells their souls to get the magic, and magic is often used for good, especially by our heroes. I wonder how much the bogus Satanic Panic of the ’80s-’90s has crippled Christianity. I don’t know, but I wonder how much it crippled my childhood. I didn’t watch or read the Harry Potter series when my peers were. I was both deathly afraid of it and self-righteously antagonistic toward it. I was afraid of my love of fantasy and tried to give it up, but I couldn’t. I was also afraid to like science fiction because of the Evolution Panic, to the point where I tore up VHS tapes about dinosaurs that someone had given me. But that’s another story. I was the same way. I thought HP was “evil witchcraft”, that D & D was evil, all of that crap. I shudder at how foolish I was and how lead astray I was by those I believed in after my dad’s death. What’s ironic — or merely self-contradictory — about this is that it came from Christians listening to other voices outside the Scripture. Folks allowed popular leaders saying things that catered to their fears rather than fearing the Lord who does warn against actual evil, but evil from within the human heart and not just the outside world (Mark 7). Folks in turn allowed the outside voices (many of them telling or repeating just plain lies) to revise the context of actual Biblical truths. And I am convinced that if the Devil was/is active here at all, it is in exaggerating his powers and getting Christians to fear him and even to practice mystical “magic” acts(!) rather than trusting in the final Prophet (Deut. 18). The main reason you hear people screeching about HP is purely because of the robes, wands, and broomsticks stuff, the small-time junk. They seem to forget that in HP, nobody invokes demons or sells their souls to get the magic, and magic is often used for good, especially by our heroes. Most (not all) Harry Potter criticisms accept as a given that the “magic” in this kind of fantasy is exactly what Scripture condemns. Those who say this have actually allowed worldly thinking — “magic is real and it looks like this, with brooms and cauldrons!” — to influence how they view God’s inerrant Word. I’m here for the community, because I want to share meaning, share a narrative. Real life is disappointing, not because I don’t get to slay dragons or visit other solar systems, but because in the smallest details of the mundane routine, meaningful interactions just never pan out. My lifestyle doesn’t give me enough time to read many novels; it takes me three to six weeks to get through one. So, the emphasis on the Christian indie-pub books is a little intimidating to me, because even though they are relatively few, I still don’t have enough time to read them all, and because reading novels is such a slow process for me, I’m less willing to take chances on books I might not enjoy. I meet many many Christians who LOVE speculative fiction. However, they love them in movie form, not books. I’d prefer people be more literate, but I am delighted that the types of stories we like are well-received under the right circumstances. So I think the future for our efforts to get out stories must cross into films at some point. And while we are at it, video games and other media. Until someone manages to do that in a commercially successful way, Christian speculative fiction will remain a small-time affair. In my opinion. My outlook has improved since Wednesday. 🙂 But I’m entirely pessimistic about potential success of fantasy/sci-fi films made by Christians. When we can’t even make a decent, joy-and-not-evangelism-or-moralism-driven contemporary film on a $10 million budget, what chance have we at making anything with a $100 million budget? The whole “lack of personal responsibility” is part of the reason I’m so reluctant to recommend fiction to anyone, even though the few people who read my blog are old enough to determine for themselves. You haven’t made it clear to me why Christians don’t deserve good stories, or how they should go about earning them. Additionally, you haven’t defined what this elusive concept of a good story is. Stories, whether told well or crudely, have been with human beings forever. The archetypes in stories, some of which are nearly universal, are recognizable to the unconscious–or, that which we’re not aware of in our conscious, waking minds. We read/hear/watch stories, and they help us grow and change as human beings. I get that we don’t have much of an intact culture for stories to become communally accepted, but is that a reason to deny this so-called group of “undeserving” Christians what you deem to be “good” stories? Since you’re dwelling in ambiguities here, I’m not sure who should be the undeserving ones. What if the “undeserving ones” find that cheesy bonnet romances fulfil their deepest story needs? What if I don’t give a flying fig about Harry Potter and don’t think the Hunger Games books were well-written? What’s it to you? And why should I even remotely care whether you think I have to earn good stories? I can watch a Korean drama or detective show, or buy whatever I please on my Kindle and be entirely satisfied and at peace in my soul that longs for stories. In any case, I’ve rambled a little, but I would like to ask one final question, and then make one final statement. Why do Jesus’ stories outpace all other oral traditions of his day? How do you back up that assertion? (That was, admittedly, two questions.) And then this–this is what I meant to say all along: Stories are universal to humans. Humans don’t “earn” them. They are simply part of our nature and who we are. Okay, let me interact with this a little. You haven’t made it clear to me why Christians don’t deserve good stories, or how they should go about earning them. We don’t. We shouldn’t. We don’t deserve them. Stories are a good gift of God to the undeserving. That’s what my rant ignored. But if the Psalmists can repeat Godly truth in one Psalm and then by the next Psalm sincerely question why God allows this-and-such injustice — a challenge that God Himself both allows and even inspires in His very Word — then so can we. Additionally, you haven’t defined what this elusive concept of a good story is. I start defining it as a story that helps as enjoy and glorify God better, loving Him more than sin. A perfect enjoyment is thing completely without sinful corruption. I get that we don’t have much of an intact culture for stories to become communally accepted, but is that a reason to deny this so-called group of “undeserving” Christians what you deem to be “good” stories? There is none. Grace prohibits this. I might rant, but can’t stay there. What if the “undeserving ones” find that cheesy bonnet romances fulfil their deepest story needs? 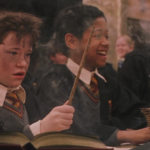 What if I don’t give a flying fig about Harry Potter and don’t think the Hunger Games books were well-written? What’s it to you? Anyway, the rest is a related topic. Q: Name or reference any other traveling teacher’s parables, similes, or symbols from first century A.D. Stories are universal to humans. Humans don’t “earn” them. They are simply part of our nature and who we are. Travelling storytellers are an ancient tradition. Jesus’ method seems to fit (best) w/ the tradition of Greek fables. From a Christian perspective, obviously Jesus’ parables are greater than any others’ because he was giving us images of the kingdom of God. I like to look at literature from a scholarly perspective, though. Stephen, I think I know what you’re saying: as long as people — Christians — are going to use shallow standards to judge stories, why should we push for better stories? Am I right? Here’s the thing that struck me: as long as people like Dr. Mohler shy away from discussing fiction, Christians will continue to use shallow standards to discuss them. We need good role models discussing stories. Goodness! Our culture is in love with stories. Even our commercials tell stories. Why should a Christian be afraid to stand up and tell other Christians how we ought to be engaging our culture? And that’s what I think Christian speculative fiction ought to do. We ought to be showing Christians to the world, showing Christians how to make an impact on the world. We ought to show truth, including the spiritual, because we alone can. And when we sidestep this issue, we give strength to those who count cuss words and declare a book good or bad accordingly. Or to those who think a book becomes Christian because someone says God. Fiction can do more, and when it does, we should celebrate it! Agreed. Thank you for that encouragement. As long as people — Christians — are going to use shallow standards to judge stories, why should we push for better stories? Am I right? Fortunately plenty of Christian leaders are flagrantly endorsing fiction, including fantasy. Last year’s Desiring God conference was all about C.S. Lewis, with more than half of that naturally about Narnia and The Ransom Trilogy. Which is why I don’t intend to sit back and wait for Big Christian Leaders to do this. It may not be their callings. Plus, we know many of us fiction-loving folks need the “mechanically” minded pastors and leaders who may be gifted in other areas, and may prevent us from drifing off into fiction la-la land apart from God’s Story.